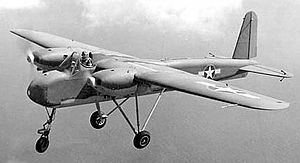 The Naval Aircraft Factory TDN was an early unmanned combat aerial vehicle - referred to at the time as an "assault drone" - developed by the United States Navy's Naval Aircraft Factory during the Second World War. Developed and tested during 1942 and 1943, the design proved moderately successful, but development of improved drones saw the TDN-1 relegated to second-line duties, and none were used in operational service. The development of the radar altimeter and television in the early 1940s made remotely guided, bomb- or torpedo-carrying aircraft a practical proposition, and in January 1942, the Naval Aircraft Factory was instructed to initiate the development of such an aircraft, with a go-ahead for prototype construction being given in February. A production contract for 100 aircraft was issued in March, with John S. Kean being assigned as project manager of the TDN-1 project, with the aircraft being designed to be capable of using either television or radar as its guidance system. Constructed mainly from wood, the TDN-1 had a fixed tricycle landing gear, and could be fitted with a conventional cockpit in place of its guidance equipment for test flights. In an example of the use of companies traditionally uninvolved in the aviation industry to reduce interference with higher priority projects, production of the final thirty aircraft was licensed to the Brunswick-Balke-Collender Company, a Michigan-based manufacturer of bowling balls and billiard tables. One hundred production TDN-1 aircraft were ordered in March 1942. Despite being specifically designed to be a simple, low-performance aircraft, and despite proving promising in testing, the type was considered to be too complicated and expensive for use operationally, and the improved Interstate TDR was selected for development as an alternative, the majority of TDN-1s being used in the test, liaison and training roles, with some being expended as aerial targets. XTDN-1 Four prototype aircraft powered by Franklin O-300 engines. TDN-1 Production version of XTDN-1; 100 aircraft produced. 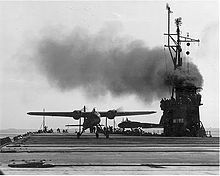 Picture - TDN-1 aircraft aboard USS Sable. one 2,000-pound (910 kg) bomb or aerial torpedo. Cunningham, William Glenn (1951). The Aircraft Industry: A study in industrial location. Los Angeles: L.L. Morrison. ASIN B0007DXJL2. http://books.google.com/books?ei=A33lTPG6JsG88ga0wOHcDA&ct=result&id=4uAmAAAAMAAJ&dq=Naval+Aircraft+Factory+TDN&q=TDN#search_anchor. Retrieved 2010-11-18. Goebel, Greg (2010). "The Aerial Torpedo". Cruise Missiles. VectorSite. http://www.vectorsite.net/twcruz_1.html#m4. Retrieved 2010-11-18. Newcome, Lawrence R. (2004). Unmanned Aviation: A Brief History of Unmanned Aerial Vehicles. Reston, Virginia: American Institute of Aeronautics and Astronautics. ISBN 978-1563476440. http://books.google.com/books?id=fkKDPM7F7bMC&pg=PA8#v=onepage&q&f=false. Retrieved 2010-11-17. Parsch, Andreas (2003). "TD Series". Directory of U.S. Military Rockets and Missiles, Appendix 1: Early Missiles and Drones. designation-systems.net. http://www.designation-systems.net/dusrm/app1/td.html#_TDN. Retrieved 2010-11-18. Parsch, Andreas (2005). "Interstate BQ-4/TDR". Directory of U.S. Military Rockets and Missiles, Appendix 1: Early Missiles and Drones. designation-systems.net. http://www.designation-systems.net/dusrm/app1/bq-4.html. Retrieved 2010-11-17. Trimble, William F. (1990). Wings for the Navy: A History of the Naval Airraft Factory 1917-1956. Annapolis, MD: Naval Institute Press. ISBN 978-0870216633. Zaloga, Steven (2008). Unmanned Aerial Vehicles: Robotic Air Warfare 1917-2007. New Vanguard. 144. New York: Osprey Publishing. ISBN 978-1846032431. http://books.google.com/books?id=HH_VZID81rkC&pg=PA68. Retrieved 2010-11-17.